Eddy and myself are so excited to finally announce that we are expecting our second baby in Feb 2015! And something I really wanted to do was to document the pregnancy and have a bit of a record of the whole process this time around. In both my pregnancies, especially my first, I really enjoyed reading about other couple's experiences of pregnancy and the week by week run down of 'what to expect.' It definitely increased my confidence reading about the highs and lows of pregnancy from real women and not just a textbook. And so, partly to record my own journey and partly to offer some real experience to other expectant mums, I thought it would be cool to offer a week-by-week rundown of this pregnancy on my blog. We had our dating ultrasound scan this week which, thankfully revealed that so far everything looks good with this bambino. Unfortunately, in both of my pregnancies, I have had a difficult first trimester which has resulted in early scanning to check everything is okay. In some ways I consider this baby to be a miracle baby! We are so blessed and extremely relieved to know that so far, everything is happening as it should! It's also really nice to know I am moving into the second trimester now which, as most mums can testify, is the nicest by far! My morning sickness has pretty much gone completely and I am feeling much more energetic and like myself. I remember last time around, when I only had myself to think about, it was much easier to take a nap when I felt really rotten or overtired, whereas this time around hasn't been so easy as I have been chasing after our little Noah munchkin. In fact, I feel like I haven't had much time to focus on this second pregnancy as my time and energy is so directed at Noah. I think perhaps that is why I have found the first trimester so exhausting this time. But, like I said, I am feeling so much better this week! How far along: 13 weeks! My dating scan pushed my due date back a week to around 17th Feb, but i'm sticking with my own dates for now (10th Feb) as I'm pretty certain mine are correct. There's always going to be some room for change! Total weight gain/measurements: So far I have gained about 4lbs, I'm quite aware of my weight gain this time round as I gained SO much last time. Im just trying to eat well and keep the exercise going to really boost my energy and hopefully keep me feeling well. I haven't started measuring my tummy yet as my bump is still very small, but my general tummy area is definitely filling out now. In the evenings, my tummy is bigger for sure. It was the same last time around with Noah in the early weeks. I always had an evening bump and then when I woke in the morning, it would have shrunken down to nothing again! Maternity clothes: I haven't done a maternity shop yet, but it's definitely on the horizon as my skinny jeans are definitely feeling the pinch now! I find myself reaching for loose dresses much more recently as tight jeans are getting pretty uncomfortable in the afternoons now. Stretch marks: No new ones. I had a few on my legs with Noah, so the chances are I will probably get a few more this time round. It really depends on your skin type. But Bio oil is definitely a great help and moisturising twice daily is part of my routine anyway so hopefully my skin will have a bit of a 'head start' before the real growth of pregnancy takes over! Sleep: Im sleeping really well at the moment, save for some crazy pregnancy dreams! Although Noah has been a bit restless as we have been holidaying this week and it always takes him a while to adjust to a new environment. Best moment this week: Seeing our little baby on the ultrasound scan. We took my mum along this time and it was a really special moment to share with her. Just seeing this little one wriggling around and the heart beating instantly filled us with such relief and pride. I can't wait to meet this little one! Miss anything? : My favourite soft cheeses, Camembert and Brie! I want these every day! Haha! Movement? 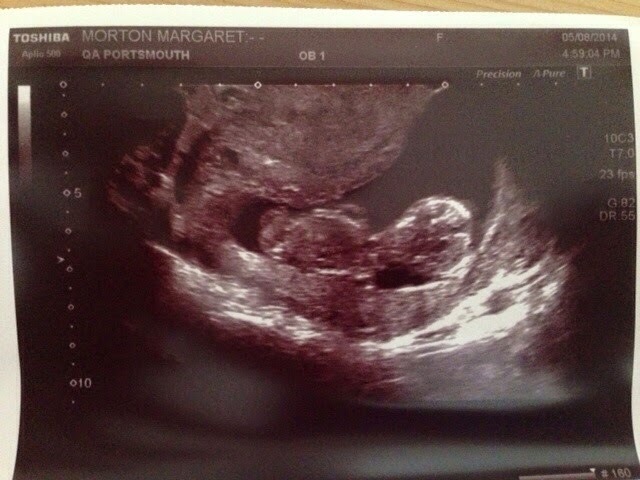 : Can't feel anything yet, but after seeing this tiny one on the ultrasound, I know he/she is one speedy little wriggler! Food Cravings: I haven't really been craving anything specifically, but my appetite has definitely increased a great deal. Food is on my mind a lot of the time and Im always hungry! Anything making you feel queasy or sick? : Not really, but my sense of smell has really heightened and some smells are bothering me a lot more. For example, I can't cope with the smell of our fridge at the moment! I know there's nothing wrong with it, I clean it out a lot but every time I open it I feel a bit green in the face! Gender: Don't know yet but I can't wait to find out! I keep imagining it's a boy, I suppose because that's all I know! But we would obviously be delighted either way. Symptoms: Mainly I have really noticed my digestion has slowed right down. In fact this was one of the symptoms that first made me suspicious of being pregnant as it happened pretty much as soon as I fell pregnant. I get full very quickly and it takes a long time to process food. All good though, as it just means my body is working hard to extract as many nutrients as it can for the baby. Belly button in or out? : in! Wedding rings on or off? : On! Happy or moody most of the time? : My husband can definitely testify I have been a bit of a handful recently! I found it really quite hard coping with all day morning sickness and running after Noah at the same time. But now things are much easier that it has cleared up, I'm hoping Eddy would say I'm less cranky this week! 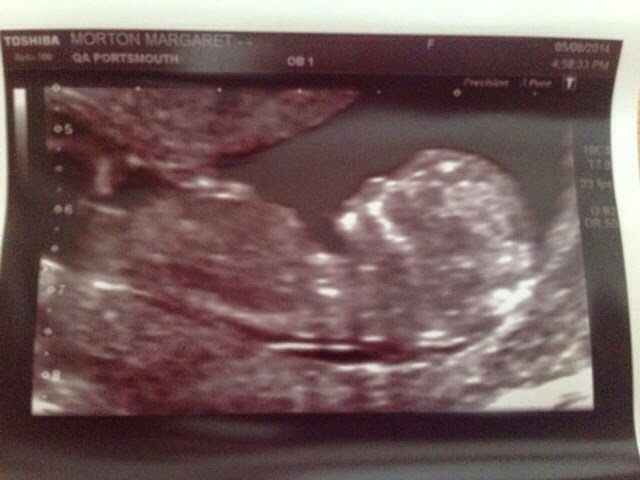 Looking forward to: Finding out the gender in October hopefully! I find it really helps to bond with your little one knowing the gender. There are no guarantees with pregnancy and so, I have the mindset that if you can know as much as possible about your baby before he/she arrives, in a way, you have more to remember and cherish! I hope some of you expectant mamas out there find this helpful. Don't forget to check in next week for my 14 week update!